Former US Navy Fleet Marine Force Corpsman [NOT A SEAL], Avid Gamer, IT Networking Student. You may incorporate any files within my mods that I, the author, hold distribution rights to. You do not need to seek permission to do this. You must credit me for my work by adding the contents of the Credits section of this mod page into your own credits section and link back to me. Modder's Guild assets may not be distributed within a commercial product without permission from the author. Even then, the original terms apply, and all commercial assets originally belonging to the product's author Must be provided to Guild Modders for use. FREE for use by anyone as long as you don't simply take my stuff and publish them as your own. Are released conditionally for other 'modders' to use, READ BELOW. Give CREDIT to me for ANY Work you use -and- LINK back to my Original File. DO NOT CHARGE MONEY for it. I do NOT give permission to use my mods or any of my assets(Meshes, textures, NPCs, etc.) for inclusion into mods that are intended for selling. PERMISSION REQUIRED FROM ME to incorporate my mods to OTHER SITES. NOTE: Some of my files may contain free to use Modder’s resources and/or custom work provided to me by my friends and other persons. Those unique works are NOT ALLOWED to be used or reverse-engineered for any PUBLIC WORK under ANY CIRCUMSTANCES. That means: All scripts on my mods are considered PRIVATE AND NOT ALLOWED TO BE USED. TRANSLATIONS are welcome - Send me the file and I will include it on the mod page. All of the modders' resources and custom content created by my friends are NOT FREE TO USE. Do not just unpack my stuff to pull resources from it for your mod without first asking me what you are allowed to use. Give proper credit where it is due. If I am offline for 12 months or longer and there's been no response from me through Nexusmods, email, etc. 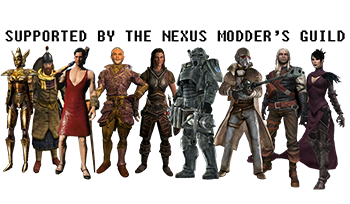 , I give full ownership and rights of all my files to Nexus Mods, for them to do as they see fit.